Over 4000 residents of Kogi State have been displaced by flood following the overflow of rivers Niger and Benue in the last four days. The State Commissioner for Environment and Natural Resources, Sanusi Yahaya, disclosed this to Channels Television in a recent interview in Lokoja. According to him the water level in Lokoja at the confluence point has risen 10 meters above, which he says is beyond the normal level. In the past weeks, several other states have witnessed increased rainfall which has led to flooding in some areas. Consequently, the Nigeria Hydrological Services Agency (NIHSA) in a statement on Thursday warned that the steady rise in water levels and weather forecast for the coming weeks have put Nigeria at risk of witnessing a recurrence of catastrophic flooding similar to what it witnessed in 2012. “There has been systematic daily rise in the water levels on both rivers. 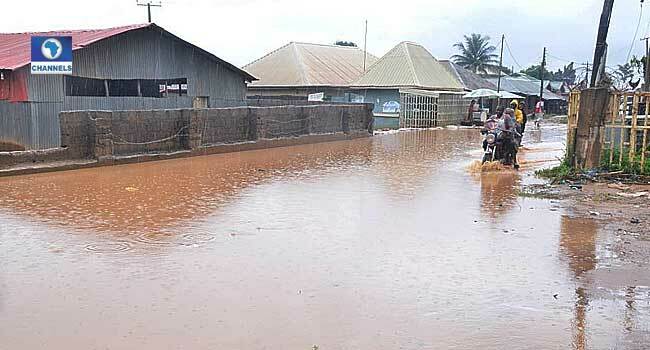 Records from our measuring stations in Lokoja (River Niger) & Makurdi (River Benue) clearly show this,” the agency said. “This situation calls for watchfulness on the part of the riparian states as there is still a likelihood of occurrence of river flooding. Shiroro Dam has already joined Kainji and Jebba Dams in spilling water. This has contributed to the steady rise in the water level,” NIHSA explained further. In 2012, catastrophic flooding had affected up to 30 states in Nigeria and resulted in the deaths of over 300 people and displaced more than two million people, according to data from the National Emergency Management Agency. NIHSA believes the country is at risk of a recurrence of the disaster if steps are not taken.